Can you tell me if I understand good this cartoon? The only safe place will be " the moral high ground " because it is above plain? and vegans are better than omnivorous people ( so they are above plain )? yes, it is a pun on the idiom. If you do something for reasons of principle and because it is the right thing to do, and you believe others should do the same, you take 'the moral high ground'. It is presumably a metaphor from war. If sea levels rise, you want to be on high ground, so you don't drown. So the joke is taking this metaphorical high ground and treating it like real high ground. Many people are vegan for environmental reasons, because farming animals takes more resources than growing plants. 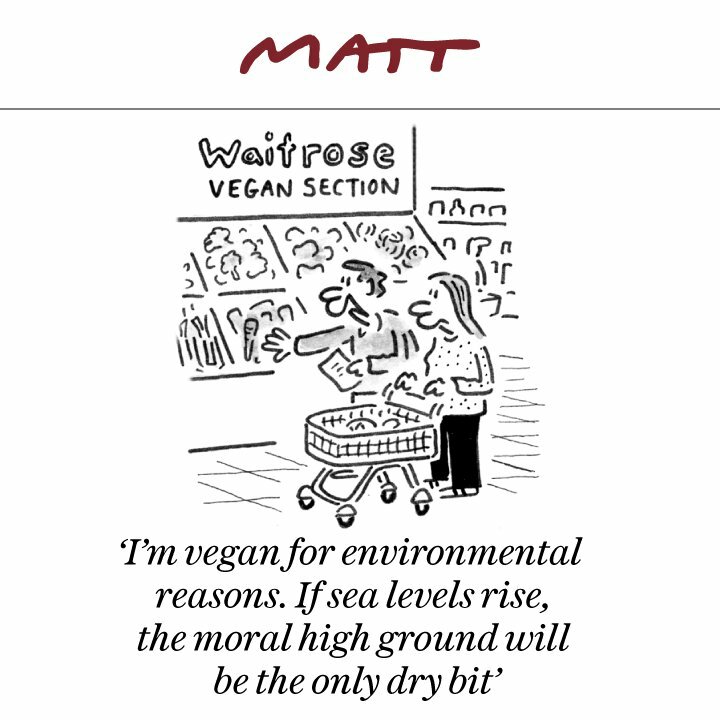 But here, the joke is it that the 'environmental reason' is purely selfish, and a pun on the idiom - to be on that 'high ground' when sea levels rise.